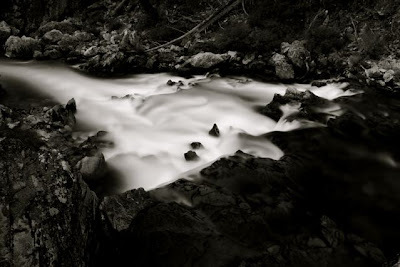 Have you ever seen one of those photographs of a river, stream or ocean with surreal looking blurred water and thought, “How did they do that?” I am going to give you a short explanation of how this works and let you run with it. First off, there are only three factors that you need to think about. Shutter speed, Aperture and ISO. The most important factor is shutter speed. 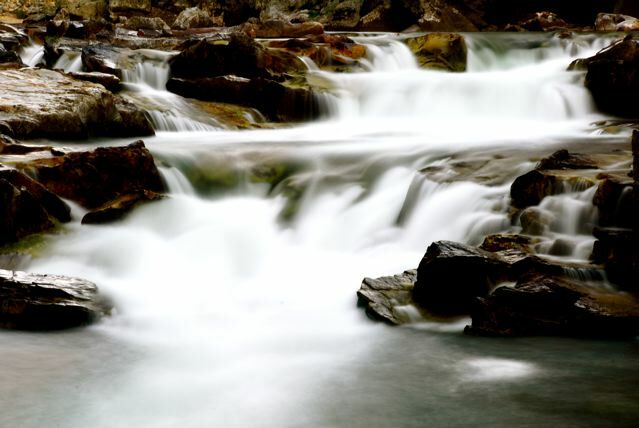 You want to tweak the ISO and Aperture in order to achieve the desired shutter speed. The speed of your shutter stipulates the amount of time that your camera shutter is open. Anything below 1/60 of a second will show blur if your subject is moving. Anything that is in front of your lens while your shutter is open will be recorded, including light. On the contrary 1/800 of a second would be a good speed to shoot rafting pictures at. The shutter is open for a shorter amount of time so there is no chance of a blurred subject. Capiche? For this type of photography you will need a tripod (or a handy rock) Whatever you use, the camera cannot move during your exposure. The goal is to capture the movement of your subject and in order to do that your camera must be completely still for the length of the exposure. Once you have found your subject, in our case moving water, set your camera to aperture priority mode “A”. An aperture in a lens is the hole or opening through which light travels onto the image plane. The size of the Aperture controls your depth of field but it also controls the amount of light that reaches your image plane or sensor. The higher the number f-stop/aperture means a smaller hole. Therefore, less light. Now you need to think about your current light. The less light allowed into the camera the longer the shutter will need to stay open to get a proper exposure. Allowing limited light into the camera can be achieved in a few different ways. Today we are only going to think about natural light without filters. Without filters you will have to shoot at dusk or dawn and adjust your ISO and aperture to achieve your desired shutter speed. So…There you are on the banks of the mighty Kern. The sun is going down and you have found one of your favorite riffles to shoot. First Set your ISO to the lowest setting. Probably ISO100. ISO denotes how sensitive the image sensor is to the amount of light present. A low ISO will require more light and your camera will compensate with a longer exposure. Depending on what kind of depth of field you are looking for you can balance between the ISO and Aperture to effect the length of your exposure. I usually start with the highest number aperture F/22 – F32 depending on your lens so that the least amount of light will be allowed into the camera. If it is starting to get dark and your ISO is set low and the aperture is set high your camera should require at least a 1-second exposure, probably longer. Think about how much movement you are going to get in that 1 second of moving water. At this point you can just play with the different aperture and ISO settings depending on the amount of blur you desire. Reading that back it sounds a bit complicated. It’s not. The beauty of digital is that you can see what you have done right away and make adjustments accordingly. Back in the dark ages with film we would take multiple shots of the same subject at different shutter speeds and see what we got after developing the film. 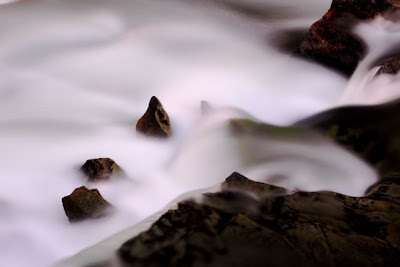 With a 5 second exposure you can turn a rapid into a silky blanket running through a garden of rocks. 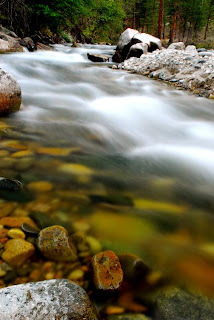 Play around with it, have fun, and don’t drop your camera in the river!